Let's look deeply into the meanings of the words serenity, acceptance, courage, change, wisdom and knowing. Serenity is the quality of being calm and even-tempered; composed. Serenity denotes the state of people who are calm and not easily agitated emotionally. They experience mental balance and even temperament. Composure is calmness that suggests the exercise of self-control. Tranquil composure suggests imperviousness to agitation or turmoil. How can I calm my emotions down and maintain a more even temperament? I can't. 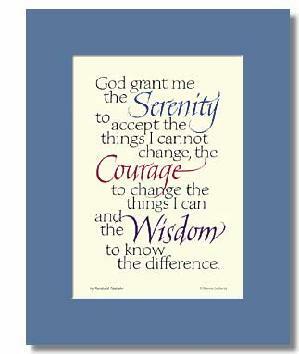 The first line of the serenity prayer asks God to grant serenity to me. If I could do it myself, I would not be asking God for it. So, giving up the idea that somehow I can give myself serenity will in fact give me some serenity, because my mind is no longer seeking something only God can grant. Acceptance means to receive something offered with gladness. God grants me serenity and all I have to do is receive it with gladness. I am grateful for the serenity that God has given me. Courage is the state or quality of mind or spirit that enables one to face danger, fear or vicissitudes with self-possession, confidence and resolution. It is being brave. Here again I am asking God to give me courage. Apparently I can't produce it myself or I would and therefore would not have to ask God for it. Maybe, like the lion in the Wizard of Oz, I have had it all along, I have just forgotten. Maybe my fears have pushed away my courage for so long, I don't even remember that courage is natural and God-given. When I was a kid, I had courage. Where did it go? I must have lost it or sent it away at some point in my life, so I can now ask God to give it back to me. Change is a transformation or transition from one state, condition or phase to another, as in the change of seasons. I am asking God to allow me to transform my mind from a state of agitation and fear to one of calm and serenity. My part in the equation is to receive it with gladness. I don't have the power to make myself serene, so I am asking God to do it for me and when my mood is transformed, I give thanks to God for the peace of mind. Wisdom is an understanding of what is true, right, or lasting; insight. Wisdom is common sense; good judgment. Wisdom is the sum of scholarly learning through the ages; knowledge; wise teachings of the ancient sages; a wise outlook, plan, or course of action. Again, I am asking God for an understanding of what I can and what I can't change. I can change my attitude toward a life experience. I can't change the experience itself; it is what it is and there is nothing I can do to change what is. Will changing my attitude change the results of an experience and give me serenity? Let's look at a typical example from an ordinary day at work. I am feeling wonderful, doing my job the best I can, when a customer calls me and says he is very upset because he didn't get what he paid for, and he blames me for selling him a faulty product. He is screaming and yelling over the phone, cussing at me and calling me every vile name in the book. My response will be based on my attitude toward the situation. My initial response might be to fight back or run from the situation, fight or flight. I might scream back and tell him to go jump in the lake. This would most certainly result in a lost customer and perhaps even a lawsuit. Instead, I breathe deeply and I remember to ask God for the ability to accept the things I can't change. Can I change the fact that the customer is upset? No. Can I change my attitude toward the customer from one of rage to acceptance? Yes. By practicing being in touch with my feelings, I can come from a place of strength instead of weakness. I can understand deeply that what the customer says and does tell me more about him than about myself. My feelings are not the customer's responsibility, and his feelings are not my responsibility, so I can stop being concerned about that. This frees up energy I am using to cast blame toward the customer or feel guilty about something I have or have not done. Attitude does make a big difference, and this attitude change comes with practice. I don't have to produce feelings of anger in order to get my way. I can calmly and firmly state my position and leave the results in God's hands, where they have in fact always been. Knowing is possession of knowledge, information, or understanding; it is showing clever awareness and resourcefulness or shrewdness. Knowing is revealed in deliberate, conscious action. I am asking God to give me the wisdom to know the difference between what I can and can't change. I am asking for knowledge, information or understanding. I want to be clever, aware, resourceful and shrewd. I want my actions to be deliberate. I want to make conscious choices. Consciousness is having an awareness of one's environment and one's own existence, sensations and thoughts. It is being mentally perceptive or alert and awake. Well, of course I am conscious, I am aware of my environment and my own existence. This is really elementary stuff here. What's the big deal about consciousness? The opposite of being conscious and awake is being unconscious or asleep. I am not asleep during the day; I sleep at night. Let's look into this awake and asleep matter deeply. I am driving my car on an interstate highway, and I am relaxed and calm. I drive for thirty minutes and suddenly I find myself in a dream state. I find that my body has been driving for quite awhile on autopilot, and my mind has been thinking about a thousand other things. I lost awareness of my environment - my body was driving but my mind was in other places. I was not aware of my own existence as a body driving a car; this was all done automatically. Now, if this can occur while I am driving, it most certainly can occur at other times in my life, and it is apparently very natural for it to do so. I learn something and I put it into play by doing it, by practicing it. I do it so much that I no longer have to think about it. I can do it unconsciously. I can do it in my sleep! Now this is great if what I have learned is producing the results that feel good to me. However, if the results in my life are not acceptable to me, then I have the ability to change what I am doing by changing the way I think. Patterns will repeat until replaced. Conditioned habits can be reconditioned or unconditioned. This doesn't occur overnight, it takes time, patience and persistence. Thoughts are just thoughts and have no power over me unless I choose to give them power by fueling them with emotion. Emotion is what turns thoughts into living, breathing beings. Thoughts are like clouds - they come and they go. Emotions are like waves - they rise and they fall. Being a witness to thoughts and emotions and choosing consciously which thoughts to give energy (emotion) to is my God-given power to discern when to actualize a thought by giving it energy and when to let a thought go by. Just like a cloud in the sky will move on its own without any effort on my part, so will thoughts. Knowing that it is natural for thoughts to come and go allows me the serenity to make conscious choices that will produce the kind of results in my life that I want. I no longer have to be a victim to my out of control thoughts, feelings and emotions. � How will this choice affect my serenity? � How will this choice change my life? Seeing thoughts simply as choices will indeed allow me to create a serene, peaceful life. Accepting God's gifts of serenity, courage and wisdom with gratitude and humility allows me to create my life patiently and calmly. � Let come what comes. � Make a conscious choice. 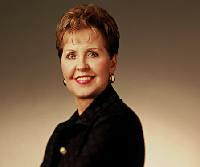 � Trust God to produce the best outcome. � Let that experience go. � Come back to now and do it all over again. Read more by Michael D. Johnson http://www.SelfAppreciation.com. 25"Therefore I tell you, do not worry about your life, what you will eat or drink; or about your body, what you will wear. Is not life more important than food, and the body more important than clothes? 26Look at the birds of the air; they do not sow or reap or store away in barns, and yet your heavenly Father feeds them. Are you not much more valuable than they?